Milwaukee-Downer College and Seminary represent some of the earliest attempts at women’s education in Wisconsin. Milwaukee Female Seminary, one of Milwaukee-Downer’s predecessor institutions, was founded in 1848 by Lucy Parsons, a progressive advocate for female education from New York. The school’s board of trustees drew representatives from Milwaukee’s prominent families, including Increase Lapham. Parsons’ connections to East Coast progressive educators brought Catharine Beecher to Milwaukee in 1851. Under Beecher’s guidance, Milwaukee Female Seminary was officially incorporated as the Milwaukee Normal Institute and High School and organized on the Beecher Plan. Funding was a constant struggle for the fledgling school, but school administrators raised enough to purchase land and open a dedicated school building in 1852. In the following year, the school took the name of Milwaukee Female College, becoming the first women’s college in the state. In 1855, the second half of Milwaukee-Downer was founded when the Wisconsin Baptist Education Society chartered the Wisconsin Female College in rural Fox Lake. Milwaukee Female College and Wisconsin Female College both weathered the Civil War while coping with financial difficulties. One solution was temporarily opening their enrollments to male students. In fact, Milwaukee Female College jettisoned word “Female” from its name entirely. Wisconsin Female College felt the funding challenges of the 1870s and 1880s more keenly because of its rural location. In the 1880s, Judge Jason Downer left $50,000 to Wisconsin Female College in his will, provided that it remained open to women only. Wisconsin Female College accepted the funds and renamed the school Downer College. The merger of Milwaukee College and Downer College was precipitated by Ellen Sabin’s arrival as president of Downer College in 1890. An energetic Wisconsin native, Sabin’s work at Downer so impressed the administrators of Milwaukee College that they offered her the presidency of Milwaukee College, along with the opportunity to merge the two schools and start afresh in Milwaukee. In 1895, Downer College moved to Milwaukee, and the new Milwaukee-Downer College was officially formed in 1897. The Milwaukee College campus was not sufficient for the combined schools. 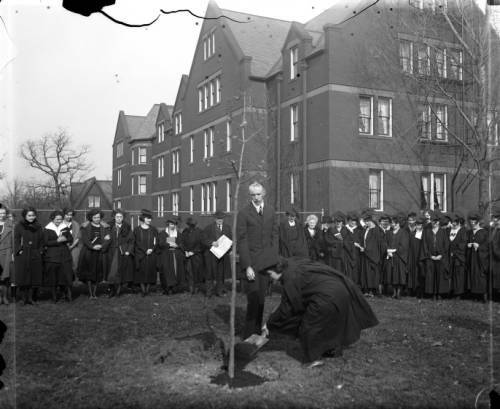 In 1897, Milwaukee-Downer College broke ground on a ten-acre site on Milwaukee’s North Side, inaugurating two decades of growth under Sabin’s capable leadership. Both Milwaukee and Downer Colleges offered preparatory courses over the years, and with the merger, Milwaukee-Downer Seminary became an official department of the college, offering a four-year preparatory course. By 1910, the Seminary became a separate institution, and in 1933 it incorporated as its own entity, although it continued to lease its buildings from the college. The Seminary expanded in 1935 when it merged with Lake School to offer education for kindergarten through 12th grade. Both Milwaukee-Downer College and Seminary adapted to the changing needs for education during the first half of the twentieth century. College curriculum shifted from Greek and Latin to the sciences, education, and psychology. In response to World War One, the college added a nursing degree and launched one of the first occupational therapy programs in the country. By the 1960s, enrollment had dwindled significantly, turning Milwaukee-Downer’s campus into an opportunity for its neighbor across the street, the newly formed University of Wisconsin-Milwaukee (UWM). In 1961, the expanding UWM bought the Milwaukee-Downer Seminary property; the Seminary itself temporarily moved to River Hills. In 1964, UWM purchased the remainder of the Milwaukee-Downer property. Milwaukee-Downer College moved north to merge with Lawrence University, whereas Milwaukee-Downer Seminary returned to the UWM campus in 1964, merging with Milwaukee University School and Milwaukee County Day School to form the University School of Milwaukee. ^ Grace Norton Kieckhefer, The History of Milwaukee-Downer College, 1851-1951 (Milwaukee: Milwaukee-Downer College, 1950), 3. ^ Kieckhefer, The History of Milwaukee-Downer College, 8. ^ Milwaukee-Downer Seminary Alumnae Association, History and Memories of Milwaukee-Downer Seminary (Milwaukee: Milwaukee-Downer Seminary Alumnae Association, 1964), 6. ^ Milwaukee-Downer Seminary Alumnae Association, History and Memories of Milwaukee-Downer Seminary, 6; Kieckhefer, The History of Milwaukee-Downer College, 49. ^ Kieckhefer, The History of Milwaukee-Downer College, 52. ^ Kieckhefer, The History of Milwaukee-Downer College, 65. ^ Milwaukee-Downer Seminary Alumnae Association, History and Memories of Milwaukee-Downer Seminary, 8. ^ Kieckhefer, The History of Milwaukee-Downer College, 85. ^ UW-Milwaukee Controversy, 1960-1963, Box 27, Folder 12, Milwaukee-Downer College Records, Milwaukee Mss L, University of Wisconsin-Milwaukee Libraries, Archives Department. ^ Milwaukee-Downer Seminary Alumnae Association, History and Memories of Milwaukee-Downer Seminary, 9. ^ Milwaukee-Downer Seminary Alumnae Association, History and Memories of Milwaukee-Downer Seminary, 10. Kieckhefer, Grace Norton. 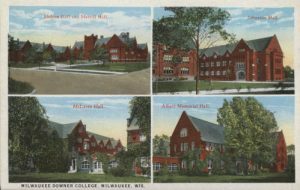 The History of Milwaukee-Downer College, 1851-1951. Milwaukee: Milwaukee-Downer College, 1950. Milwaukee-Downer Seminary Alumnae Association. History and Memories of Milwaukee-Downer Seminary. Milwaukee: Milwaukee-Downer Seminary Alumnae Association, 1964.